This post is about the Delwara Heritage walk that is run by Seva Mandir near Udaipur in Rajasthan, India. For years I was following the projects of the NGO Seva Mandir in Udaipur and considered volunteering with them. Unfortunately my studies brought me to other places in this world, but when I visited Rajasthan last November I was hoping to see some of their work in Delwara. Seva Mandir is an excellent community based organization focusing on women empowerment, youth development, health and education using participatory methods. 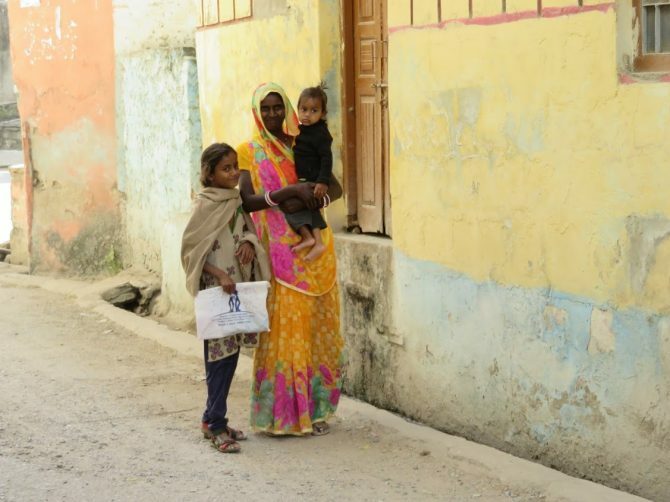 They have been working in Rajasthan since 1968 and are now supporting over 700 villages around Udaipur. One of these villages is the small town of Delwara where Seva Mandir is organizing heritage walks for travellers. Local guides will show you around this old village that has a long history. Delwara was once the capital of the Delwara district of the Mewar kingdom. There is a beautiful 18th century palace and several Jain temples that are more than 1000 years old. I immediately signed up for this interesting and affordable tour, but I was also a bit worried. A lot of NGO’s in India see the tourism potential for fundraising and have made poverty into some kind of business. They show tourists the worst of the worst and tell the most heart breaking stories. This exploitation of the misery of other people is all meant to work on your feelings so that you will donate as much money as possible in the end. Unfortunately this money does not always go towards improving the lives of the people that you met on your tour. Things in India are not always what they look like and you are often left guessing if it was all true what you saw in the first place. The good thing was that Seva Mandir was not advertising the Delwara heritage walk as a slum tour, but instead they were trying to attract people with the cultural heritage and crafts traditions of this village. Ancient traditions that the people of Delwara are rightly proud of. Still, I was a bit skeptical when I took the bus from Udaipur to Delwara. Our guide picked us up from the bus station with a smile. He was a young student and spoke excellent english. The Delwara Heritage walk turned out to be one of the best tours I had in India. Our guide did not show us poverty but he gave us insight into the daily life of the people in a rural town in Rajasthan. He explained the challenges they face, but also their achievements, progress and opportunities. Our first stop on the Delwara heritage walk was Seva Mandir’s local youth and community center. The center is also a production studio where women are making dresses. The community center looked well run, but the real work that Seva Mandir was doing in Delwara was outside. The 3 hour Delwara heritage walk was an interesting and well balanced combination of history, temples, crafts and Seva Mandir’s projects. One of such projects is a waste collection program that explained why the village was relatively clean for Indian standards. Another project was to improve the access to water by building wells and renovating the old traditional stepwells. On the Delwara heritage walk our guide managed to explain a lot about the Jain religion and their focus on non violence. Many Jain pilgrims come to Delwara because of the importance of the Jain temples here. What I love about the Jain temples is the beauty in small details and the statues of the gods that look so calm and serene. I can see why they call Delwara the town of Gods. I left Delwara with a positive feeling. It was a great walk and one that I can recommend to anyone visiting Rajasthan in India. The Delwara Heritage Walk was a highlight to my visit in Rajasthan. The village is beautiful and there is so much to see that I am wondering why Delwara is not in the Lonely Planet. I was also surprised to find out that Seva Mandir is not receiving as many visitors as I would expect given the high quality of the Delwara Heritage walk tour and the beauty of the town. It makes a perfect day trip from Udaipur with its colorful streets, beautiful royal palaces and old Jain temples. Delwara is a quiet and peaceful village where we received some curious stares and smiles, but zero hassle. A nice change from some of the other places in Rajasthan. Delwara is 40 Minutes from Udaipur and makes a perfect day trip. You can take a taxi or the local bus. From 07:30 AM till 17:00 PM there are frequent buses between Udaipur and Delwara (at least 2 per hour). The Delwara heritage walking tour costs 300 Rs per person (discounts for bigger groups are available). They are organised by Seva Mandir. If you want to arrange a tour you can contact them by calling them at: +91 8107495390 or by e-mail at: delwarawalk@gmail.com. Tours can be arranged between 10 AM till 6 PM 7 days per week and last between 2 – 3 hours. To read more about everything there is to see and do in Udaipur and Rajasthan. Check my post about Udaipur here and my backpackers guide about Rajashan by train here. India is my next big destination! I’m having trouble narrowing it down, but this post was very helpful! Headed to India in July and this has got me so excited 🙂 Love learning about places that are off the beaten track. What a fabulous find Delwara is. I love off the beaten track so this is right up my alley. A well-written blog and so nice to see that poverty isn’t being exploited by your guide but instead an education about another culture and the daily lives of those who live near Delwara. Thanks.